Former World Bank economist, Peter Biar Ajak, was one of seven men who were detained in South Sudan and charged with insurgency, sabotage, possession of weapons, and attempting to stage an uprising in the country's main national prison in October. The men are being tried in a civilian court and have been accused by the National Security Service for stealing firearms and communicating false statements whilst detained. If found guilty they could be sentenced to death. Kerbino Agok Wol, a South Sudanese businessman who has been with Biar, was accused of spearheading the insurgency and speaking with the US news outlet, Voices of America whilst in jail. On Monday, Biar rejected a document that was presented as his statement claiming; “the investigation was conducted under gunpoint to my head”. He first appeared in court last Thursday, after months of demands from US senators and other international figures that he and Wol be charged or released. He was detained for over seven months without being charged, being initially detained last July. Wol’s lawyer, Ajak Mayol Bior, asserted that there was no act of terrorism and that the charges of possessing arms were fabricated. Monyluak Kuol, Biar’s lawyer, has maintained Biar’s innocence and called for the case to be dismissed. Kuol told the court that Biar was a civilian with no connection to the charges brought against him. The charges being brought against the men are notably different from the reasons given for their initial detention. 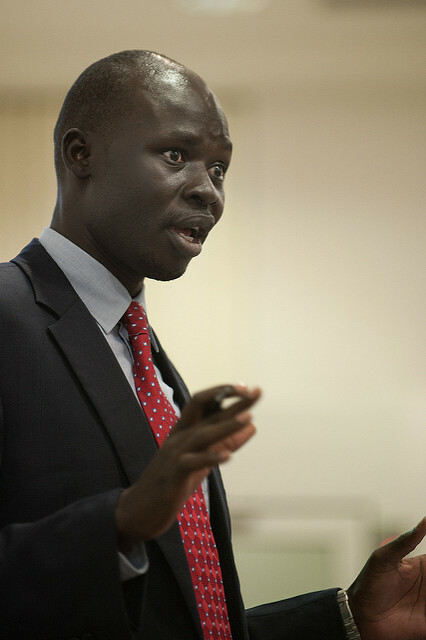 The Public’s Radio reports that the document presented to the court had references to incidents “with names and dates that didn't match the present case”.In March the UN released a statement criticising Ajak’s arrest stating there was a "clear trend in the use of national security and counter-terrorism legislation by states to criminalise free expression and the legitimate work of human rights defenders”. According to Amnesty International, South Sudan’s government has been summoned for the first time ever to the East African Court of Justice over the arbitrary arrest and detention of Wol. Supporters of Biar, claim that he was promoting South Sudan’s peace process when he was arrested. South Sudan has been in a civil war since 2013, two years after it claimed independence from Sudan. Disagreements between the country’s President Salva Kiir and deputy, Riek Machar, descended the nation into a civil war. The conflict displaced a quarter of the nation’s 12 million and devastated the oil-dependent economy. Last year, a regionally brokered deal brought an end to the conflict and had Machar return to government again as Kiir’s deputy. Despite this agreement, there remain pockets of violence in some parts of the country.